High Density Polyethylene (HDPE) Market size was valued at approximately USD 60 billion in 2015 with gains of over 4% CAGR between 2016 and 2024. HDPE is widely used for packaging in personal care products, pharmaceuticals, and food & beverages. It has a greater strength to density ratio and better mechanical properties as compared to low density polyethylene (LDPE). Packaged food & beverage demand is increasing owing to the improved standard of living amongst youth. Also, there is an increasing adoption of ready-to-eat and ready-to-mix packed food due to fast moving life in metro cities. The product exhibited a growing demand in the pharmaceutical industry in 2015. Opacity and higher working temperature of up to 115oC are the major factors to be considered for the material to be used in medicine bottles and other medical packaging. Growing population and rising health concerns have contributed to the growth in the pharmaceutical industry. Moreover, hospitals and pharmaceutical companies prefer high density polyethylene bottles over glass bottles as they are easy to handle and less reactive to the surrounding atmosphere. It is also significantly used in household goods and fireworks. In developing countries, such as India and China, household goods market is at its peak. Moreover, growing consumer awareness and rise in disposable incomes have increased their spending on such household goods. Manufacturers are also enticing customers to purchase their goods by offering attractive and unique products. Blow molded HDPE market accounted for nearly 26% share in 2015. High density polyethylene is preferred in blow molding process due to its ability to withstand high temperature, resistance to stiffness, and cracking. Blow molding process is majorly used in producing plastic bottles and other products such as recycle bins, overflow bottles, water tanks, fuel tanks, and duct work. Sheets and films forms of the product contributed to over 20% in 2015. Affordability, ease of fabrication, and chemical inertness make it suitable for various end-users as it can be subject to harsh chemical environments. This material is available in a wide range of product grades as per their properties such as impact strength, rigidity, flexibility, breakability, and clarity. Injection molded varieties contributed to over 15% of the market share. Injection molding is a process of producing low-cost parts with fast cycle times. This technology is used to manufacture a wide range of products from computer components to cell phones. It melts plastic pellets and injects molten plastic in a mold inducing high pressure to get the end product. High density polyethylene is majorly used in the packaging of personal care products, pharmaceuticals, and food & beverages industries. Personal care products are widely used amongst young generation and especially women. The cosmetics industry is flourishing steadily in developing countries of Asia Pacific such as India and China. This growth in the end-user segments is likely to further boost revenue gains for HDPE over coming years. High density polyethylene pipes are used in agriculture for water supply, drainage, and irrigation. Also, these pipes are much more affordable in terms of material cost, performance, and installation cost. Additional benefits of are its lesser pipe laydown area and reduced need for fittings due to its low bending radius. Moreover, HDPE pipes are corrosion resistant and can withstand corrosive conditions and salty water. Escalating construction spending is likely to boost high density polyethylene market during the forecast period. As it is used for construction-related products such as telephone ducts, plumbing and electrical boxes, and pipes. 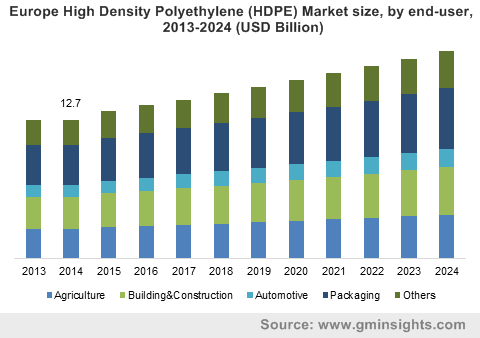 Upcoming construction projects, such as commercial buildings, roads & highways, residential projects, hydropower, and urban transportation, are further contributing to the high-density polyethylene market. Asia Pacific accounted for a relatively higher share of over 40% in the global high density polyethylene market. Construction spending is increasing steadily in developing countries. India and China have recorded their construction spending as USD 420 billion and USD 1.75 trillion respectively. In 2015; this will impact the high-density polyethylene market positively. Moreover, increasing crude oil production is fueling the high density polyethylene market in the region. Europe HDPE market accounted for more than 20% share in revenue generation and is likely to register nearly 3% CAGR by 2024. Europe has witnessed a healthy adoption of blow molding technology due to flourishing automobile, electronics, and telecommunication industries. This industrial expansion has developed the infrastructure in Germany, Italy, Spain, etc. Further, the employment generated by these industries has driven residential projects, contributing to the high-density polyethylene market. Food & beverage, cosmetic and pharmaceutical packaging industries in the U.S. has boosted North America and Latin America high density polyethylene market. The ever-growing infrastructural development in the region is likely to help the growth of the product market and provide opportunities for enhanced product forms through R&D. Key manufacturers of various grades in the high density polyethylene market are The Dow Chemical Company, Honam Petrochemical Corporation, PetroChina Company Limited, Borealis AG, and Abu Dhabi Polymers Company Ltd. Other key participants in the industry include LyondellBasell industries NV, Formosa Plastics Corp., Exxon Mobil Corp., Chevron Phillips Chemical Co., and Braskem S.A. Different grades have various end-user scope such as injection molding, blow molding, sheet and film extrusion, and profile extrusion. Injection molding technology is used in electrical and electronics industry to produce switchboards, plastic ducting, and other plastic extrusion products. Blow molding technology is adopted in water purification industry to generate plastic cans and bottles. Thus, booming electronics and electrical industries coupled with mineralized water demand are fostering the high density polyethylene market.